Like my shirt? Good, you can have one. Note: If you're a dude (or lady, whatever) and not into the feminine aspects of these fonts or lyrics, I'd be happy to substitute any Beatles lyrics of your choice! In fact, three of you can have one! When Printkeg offered to let me design whatever shirt I wanted and give it away on my blog, it took me like a week to decide what to put on it. I settled on these words because they're from my favorite song, "Here Comes the Sun" by the Beatles. That song never fails to put some happy in my soul, so I figured the shirt might be able to accomplish the same! Also, you know that I love that a simple gray v-neck T-shirt was amongst the dozens of design options when customizing the shirt. Yessss. I stuck to men's sizes (women's shirt sizes are usually too tight/short for my liking), and couldn't be happier with the loose, comfortable fit and v-neck that is a v-neck without plunging to my navel. Double yessss. Enter via the widget below! Giveaway ends Monday, Feb. 24. And thank you to Printkeg! Check out their other customizable goods, from posters to stickers to postcards to banners. In their own words, they're THE cheap online printing company. Woot! UPDATE: If your name is Alicia H., Laura H. or Natalie W., winner winner chicken dinner! Listening to that song right now and feeling multiple levels of happiness enter my soul. Lets be honest, all of the beatles songs are my fav, but probably let it be, or twist and shout. What a perfect shirt for a gloomy winter!!! I'm a sucker for all the songs but Across the Universe is my fave. Good stuff. can i have a shirt? For me its Yesterday...love it! mmmm you have such great taste. I really wanted it to say "do do do do" but you made it look better... :) Still, twinners? im in. I do love "Here Comes the Sun" but "Blackbird" is up there too. love this! one of my all time favorite songs! and i'm totally with you on the women's v-necks being wayyy too deep. My favorite in elementary school was Maxwell's Silver Hammer...now though I'd have to say it's I've Just Seen a Face. oops I just saw I was supposed to tell you my favorite beatles song. it's definitely hey jude or here comes the sun! As we speak, it smothers me. "Let it be, oh let it be"! I need NEED this shirt! Choosing a favorite Beatles song is like choosing a favorite kid. I just can't pick. My grandma had Yesterday as a roll for her player piano, so that song reminds me of visiting her. I have had the worst morning (this Michigan winter is testing the limits of my snow-loving soul). And then I saw the shirt and, man are you right!, happiness. Just like that. Thanks for all you do, Katie! Bam. Haikued. And while NW is A favorite, I don't know if I could pick ONE favorite. Too many great choices. any shirt with beatles lyrics on it is a shirt i need! 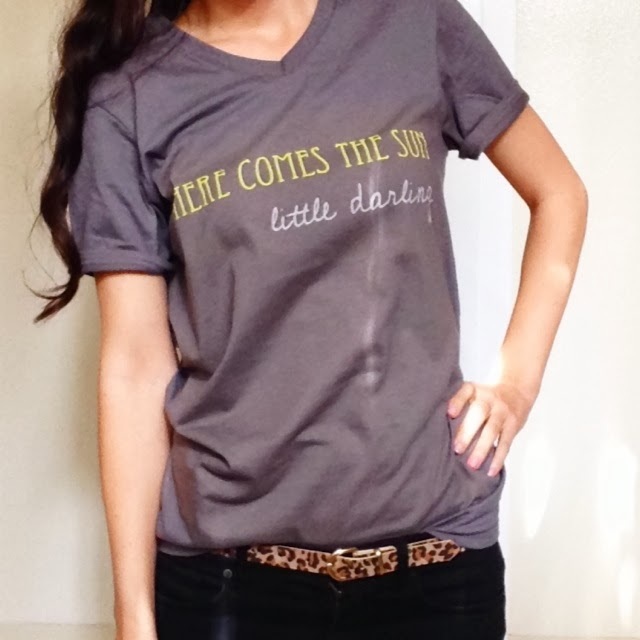 I think Here Comes the Sun is the fav! Cute shirt! So cute! And so awesome! My favorite Beatles song is "Hey Jude" thanks for the chance to win this one. I love the song, "Hey Jude." So many great Beatles songs but my favorite is All You Need Is Love!! Ooohh! Favorites are Twist and Shout and Here Comes the Sun!! Love the shirt. Um, Lucy. Or Hey Jude. Or all of them. lol. So you'll know that I love you. And want to match you. My favorite song by the fab four is Hey Jude because a young man with autism I used to care for came alive every time he heard it! Here Comes the Sun is a close second. Thank you for sharing your great talents! Why we gotta be so mean?